RoadTrip Newport Oregon Rocks! ChemTrails Too! Robyn & i are on a Roadtrip trying to Revive the AMERICAN Economy! We are also Baring Burdens & Exposing ChemTrails. We are Offering alot of Services, so Please check out our Youtube Roadtrip Videos. Check Us Out! Sponsor Us! Help Out! Posted by admin. Categories: News advertising. Tags: ChemTrails, Newport, Oregon, RoadTrip, Rocks. Comments Off on RoadTrip Newport Oregon Rocks! ChemTrails Too! Bristol, Rhode Island architect Russell Warren designed this building for the Zion Episcopal Church in 1834. Constructed by William Weeden, it was originally a classical, temple-style Greek Revival building with capitals on the columns in Ionic order. The Zion Episcopal Church was founded in 1833 by a group that separated from Trinity Church to form the second Episcopal parish in Newport. The zion Church remained in the building until 1885, when the congregation moved, eventually becoming St. George’s Church on Rhode Island Avenue. In 1885, the building was purchased by the Catholic Church for St. Joseph’s Church. This was the second Catholic parish in Newport, formed as the Catholic population formed to swell. St. Joseph’s remained here until 1912 when it sold this building and moved into its new church on Broadway. In 1918, the building reopened with a secular new identity; it had been converted into the Lafayette Theater. To gain more space, the original open colonnade was enclosed and the columns removed. In 1919, the name was changed to the Community Playhouse. Both were short-lived vaudeville theaters. In 1922, it became a movie house known as The Strand. 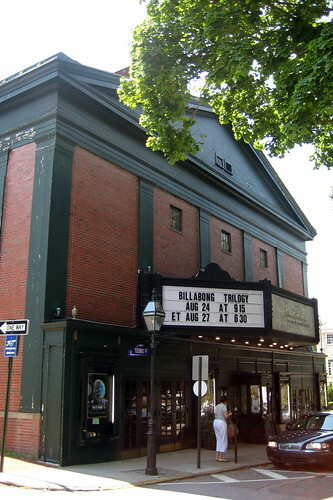 In 1974, Joseph G. Jarvis bought the theater and renamed it the Jane Pickens after the Newport summer resident and well-known singer. This is a beautiful stretched-canvas art print wrapped on 2.5″ thick stretcher bars. The print is professionally printed, assembled, and shipped within 2 – 3 business days from our production facility in North Carolina and arrives ready-to-hang on your wall. Fine Art America is home to more than 35,000 artists from all over the world who entrust us to fulfill their print orders online. We offer a 30-day money-back guarantee on every print that we sell and look forward to helping you select your next piece.